Ah, who could forget the 80's? In that decade I graduated from high school, went to college, and joined the working world. The fashions and the hairstyles probably should be forgotten. (Remember my classmate's big hair?) But the music ... Most of us probably know more of the lyrics than we'd care to admit. Who can resist singing along with songs like "Hungry Like the Wolf" by Duran Duran? If you're a fan of Duran Duran, or even if you just like "Hungry Like the Wolf," you might be interested in this. Last month, Trident sponsored the first of its "See What Unfolds Live" event. 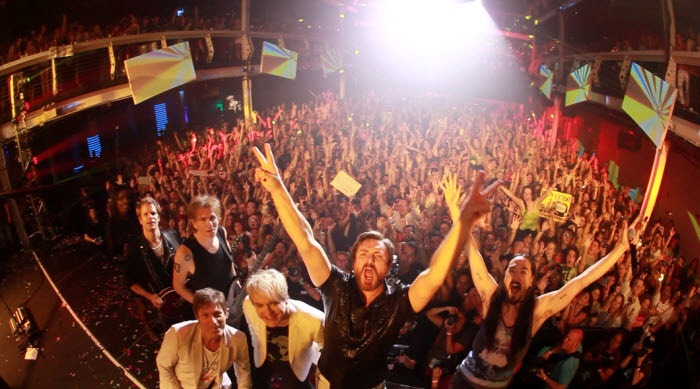 Attended by 3000 fans and hosted by DJ Steve Aoki, the event included an appearance by Duran Duran. But the centerpiece of the evening was a Steve Aoki produced and remixed performance of the band's classic hit, "Hungry Like The Wolf"--aptly named, "Hungry Like The Wolf: Steve Aoki vs. Duran Duran - The New York Werewolf Mix." But wait: there's more! :) After that, Trident launched a music video competition on the website Genero.TV. Fans had the chance to make their own videos for the new track, and the makers of the top videos will win big. The jury winner will receive $10,000, with two runners up each winning $2,500. The winner chosen by the fans will get $5,000. That's where you come in. Through July 27, the public can join in on the fun to help choose the official music video by voting for one of the finalists. On July 30, the winning video will be announced as the official video of the collaboration. Disclosure: I received product samples, at no cost to me, as a thank you for this post. All opinions in this post are my own.